Does something other than a ninth planet explain some of our solar system's quirks? There might be a ninth planet lurking at the edges of our solar system. At least, that’s what a number of astronomers theorize. Some of the smaller junk, minor planets and space rocks and such, in our solar system aren’t following the exact orbital path we’d think they would. Something else, something massive, is pushing them out of their predictable paths. The most elegant explanation, at least according to some astronomers? an undiscovered ninth planet (no, still not Pluto, dammit) that’s several times larger and denser than Earth. That may seem pretty out-there. Well, new evidence suggests that many of the solar system’s quirks could be explained without such a planet. New research presented Monday at the 232nd meeting of the American Astronomical Society, and reported by Space.com, suggests that some of the evidence that proponents use to show that Planet Nine exists could also be explained by smaller space rocks that are moving through outer space as a group. In the past, some Planet Nine critics have argued that, in fact, there’s no massive planet or cluster out there at all. To skeptics, those bizarre, misaligned orbits are most likely due to inaccurate measurements or are otherwise random. The new research doesn’t directly bolster Planet Nine supporters, but it doesn’t support the skeptics, either. 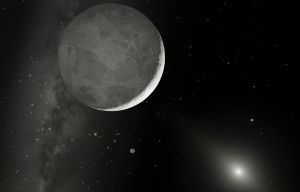 According to the researchers, in an effort to cut down on the computational power needed to run them, most models used to track the thousands and thousands of those rock clusters, called Trans-Neptunian Objects, didn’t properly account for their mass. That would have meant that the models would have been pretty far off, presenting a simplified view of how these objects interact with other objects, and with one another, in their distant orbits. Because they’re so far away from the sun, the rocks’ own gravity could be strong enough to make them cluster together. The study suggests that a rock cluster could explain some (though not all) of the astronomical phenomena that are attributed to the hypothetical Planet Nine. For example: why do many of these distant objects all orbit with the same tilt? If Planet Nine definitely existed, that would make sense; the rock cluster theory doesn’t explain that fact nearly as well. So, this isn’t the perfect theory. You know what would put this debate to rest? Actually spotting the damn thing, whatever it is. Until then, our own models and measurements — and the new theories they spark — will just have to do.